This Week at Saxelby Cheesemongers… Cheese & Pickle Picnic, Plus Local Cheese Celebs from Casellula on Cutting the Curd! How is this possible? It’s already time to start making Labor Day plans?? Well, I may not know where the heck I’m going, but I know what I’ll be eating! 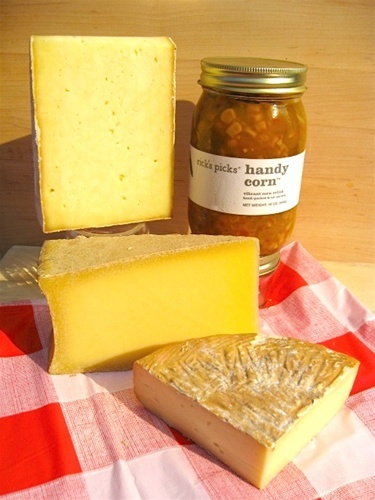 This Labor Day, Saxelby Cheesemongers and Rick’s Picks have dreamed up a little cheese & pickle picnic that’s the perfect addition to any Labor Day celebration! Going away for the weekend? Want to send a loved one a little cheesy surprise? Why the heck not… Cheese and pickles make people happy darn it. click here to send a box of cheesy goodness to someone you love today! Rick has been our pickled partner in crime for just about as long as we’ve been around. Cheese and pickles are one of mother nature’s finest flavor combinations, and we’re always excited to share our latest and greatest pairings! This Labor Day, we decided to take the corn off the cob and put it into a jar of that vibrant, delicious pickle relish known as Rick’s Handy Corn. This extremely dextrous and malleable condiment wants to make a splash all over your Labor Day menu: nachos, quesadillas, atop bratwurst and hot dogs… or simply munched alongside a wedge o’ cheese. Spring Brook Tarentaise, a nutty raw cows’ milk cheese from Spring Brook Farm, Dorset, a creamy and ever-so-slightly pungent raw cows’ milk cheese from Consider Bardwell Farm, and Landaff, a tart and tangy raw cows’ milk cheese from Landaff Creamery. This is a fermented dream team for the ages. Get it while the gettin’s good! **When placing your order, please let us know the date you’d like us to ship! Saxelby Cheesemongers ships Monday-Thursday with Fedex overnight delivery service. Tonight on Cutting the Curd, we’ll chat with Brian Keyser, otherwise known as the cheese baron of Hell’s Kitchen. Brian is the owner of Casellula Cheese and Wine Cafe, as well as the recently opened Elsewhere. Joining Brian will be Dimitri Saad, fromager in chief and all-around cheesy guy. Listen in and discover two of NY’s most fabulous cheese-centric restaurants!